Solar Gardens use the sun’s energy to power pumps, fountains and ornamental lights throughout the year. Solar powered path and garden lights are nowadays becoming common in most garden centres, DIY stores as well as online because as we have seen throughout this alternative energy website, there are a lot of advantages to the free and green solar power. As well as the fauna and flora, two other important elements that make up a garden landscape is water and lighting. A garden pond or water feature adds sound and interest to a garden while at the same time helping many of the birds, bees and other such insects that the presence of water in a garden brings creating a healthier and more beautiful environment all year around. Lighting adds interest and safety to a garden at night. Accent lighting, security lighting and low level pathway lighting make it possible to use and enjoy the garden during the night once the sun has gone down. Garden lighting products can also bring coloured lighting to the garden and with a huge range of decorative and stylish lights to choose from they are also easy to install. One of the main disadvantages with installing conventional mains powered lights, pumps and fountains within the garden is that they all have to be hard wired and of low voltage. This may require a single or multiple transformers to step-down the mains voltage, connection boxes, cables and conduits which are all potential exposed to the rigours of the weather and elements. Also there is the vulnerability of forgetting where they are and digging up or cutting these cables with a gardeners spade. A solar powered garden has none of these disadvantages. Most solar powered lights and ornaments are a single self-contained unit incorporating a rechargeable battery, making them ideal outside in a solar garden. These solar powered lights are generally designed as lanterns, posts, or patio fixtures that can be placed anywhere within the garden charging their batteries during daylight hours and switching “ON” to provide illumination in the garden as the sunlight fades. Many of these solar garden products are particularly suited to solarisation because they are only required to operate during the day when the sun is shining and the garden is in use. This means that solar fountains and water features such as troughs, pedestals and bowls can be directly driven from a single solar panel. 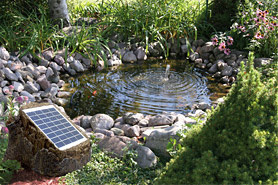 Adding a solar-powered water feature to your garden is also a great way to create a peaceful relaxing atmosphere. But the biggest advantage of all, is that solar powered garden lighting and ornaments can be easily moved from its location to a new location within the solar garden without the need for an electrician to rewire them. However, it must be remembered that any solar garden product will only work well as long as the solar cells receive the recommended hours of sunlight to operate or to recharge their batteries during the day. Solar gardens put the emphasis on small and medium scale solar generation within the garden and as we know, locally produced solar energy is the best kind of solar energy. Solar products designed for use in the garden, especially accent or security lighting and aquatic items such as fountains, pumps and water features are generally low voltage and wattage devices which can be run of a single low wattage 12 volt photovoltaic panel. One of the quickest and easiest ways to put solar photovoltaic panels to work around your garden is to purchase a self-contained kit. Generally, these solar kits in a box can power everything from a small shed or workshop to the whole house. They are quick and easy to install, requiring no specialist tools or knowledge offering a cost effect way to generate your own electricity. But what if we wanted to power more items or larger pumps or lights within the solar garden, how would be do that. In our alternative energy tutorial about connecting solar panels together, we saw that photovoltaic panels of different sizes can be connected together to produce higher wattages. There are numerous small applications within the solar garden which may require more power than that supplied by a single PV panel or solar kit, such as water pumping for larger ponds or fountains, irrigation of the garden, multiple garden ponds, swimming pools or summer house lighting, etc. the list is endless. But before we get carried away, lets assume we want a solar powered water pumping system for our solar garden. This could be a bigger pump for a water feature, fountain, pond, aeration and filtration for a pond, irrigation or submersible pump, whatever we want. In this tutorial we will assume we need to power a standard 24 volt DC (Direct Current) motor as part of generic stand-alone PV system in our solar garden. Consider the basic setup below. The DC motor which drives the pump can be supplied directly from the solar panel or from optional storage batteries for use at night when the sun does not shine. DC motors are generally more efficient and permanent magnet DC motors are often preferred within a solar garden environment. DC motors that use carbon brushes require maintenance and ventilation making submersion awkward. Brushless DC motors overcome this problem but at a cost. If used directly it is important to match the DC motors power requirements to the photovoltaic panel. Ideally, the PV panel should be operated as close to its maximum power point (MPP) condition in all types of sunlight conditions. If this is not possible a DC to DC controller can be inserted between the PV panel and motor to improve matching and increase efficiency. If deep cycle batteries are used as part of the solar gardens system, then the solar charge controller will regulate the flow of current from the PV array to the batteries and from the batteries to the DC motor. While the simple stand-alone DC system above can be used to supply 12V, 24V or 48V DC motors (or lighting systems) with or without a battery bank to power solar garden pumps and lights, this type of system may need a large PV panel to operate, 100 to 200 watts or more. But we are not restricted to using DC motors as part of our stand-alone off-grid installation, AC (Alternating Current) motors can also be used as AC motors are very rugged requiring little or no maintenance, so are suitable for submersion in large garden lakes, ponds or at the bottom of a well. When a stand-alone PV system is to deliver AC power for electrical motors (or lighting) an inverter must be used. Inverters convert the DC power coming from the battery into AC power that the motor or pump can use as shown. An AC system is similar in many ways to the much lower power DC system except with an inverter added as the single-phase AC motor is operated using solar power with an additional inverter. The power rating of the inverter should be at least five or six times that of the AC motor in order to withstand the peak surge current at start-up. Inverters for stand-alone off-grid applications are available from about 100 watts up to several kilo-watts (kW) producing a modified sine wave or a pure sine wave output depending upon price. Replacing a single photovoltaic panel with an array or increasing the size of the battery bank to give more storage capacity provides more power for a longer time allowing solar gardens to be used all year around as well as during the night. However extra equipment is required as the additional power must be regulated and controlled increasing the capital cost. We can also connect together solar panels of different wattage and voltage ratings to charge multiple storage batteries and provided voltages higher than 24VDC. For example, part of the system could be used to serve as a power source for pumps and motors in one section of the solar garden, while another part could serve as a power source for garden lights, etc as shown. In this simple example above, 24V is used to power a DC pond/fountain pump motor while a 12V circuit is used for lighting the pond or surrounding garden. Schottky diode protection prevents one photovoltaic panel supplying the other. Charge controllers regulate the charging of the batteries which are connected together in series to give 36VDC in total to supply an AC inverter and pump motor, for example. The possibilities to supply a solar gardens power requirements are endless. DC power direct without battery storage or inverter. DC power system with battery storage, without inverter. AC power system with inverter, without battery storage. AC power system with inverter and battery storage. Hybrid with both DC and AC available with or without battery storage. Not only is using the free solar energy in the garden a great way of going “green” thereby helping to save the planet, it can also be much safer, easier and cheaper than installing mains powered electrical equipment around your garden. The beauty of a solar powered garden is that within a few hours you can listen to the gentle sound of running water from a fountain or water feature, have the security and safety of solar powered lights at night and not spend a penny more on your electricity bills to run them. Of course, sizing you solar panels or pump motors is one of the most important tasks during the design of any stand-alone or off-grid PV system. The sizing procedure for a solar gardens layout will determine the electrical power rating of the PV array and the storage capacity of the battery bank needed to power the pumps and/or lights as well as the electrical configuration of the PV array. To learn more about solar gardens, or if you just want to explore the advantages and disadvantages of how to create a solar powered garden, then Click Here to get started with a choice of solar powered products you can install in your garden or back yard. I have 12 vdc panel, 12 vcd used motor cycle battery, and 12 vdc pump for my pond. Do I need the 12 vdc charge controller? Can I connect pump directly to battery and the battery directly to panel for charging? The basic answer is yes, but your battery may not be correctly charged and protected if you have no charge controller. I have a small solar powered pump for my pond with a back up battery for night . Battery is not great , would it be possible to connect the pump to a powerbank battery so it lasts the whole night or would this burn out the pump . If the new battery has the same voltage just a different Ah rating to extend the time, then there is no reason why the pump would not burn out. I have two solar panel kits and pumps for my Koi pond. One for the fountain and one for the waterfall which also aerates the water. Can I connect some colored lights and batteries to one of the solar panels or do I need another solar panel. Thanks. Hello Jenkins, you can, in theory, connect your lights to one of the solar panels, but the total power drawn by both the pump and lights may exceed the panels rating. Also during dull cloudy days the lights, which will only illuminate during the day, may take most of the solar panels power stopping the pump. It would be better to have a separate panel just for the lights, a bigger panel for pump and lights (you will need to check the power ratings), and maybe a storage battery for the night, as this is when you need the lights the most.